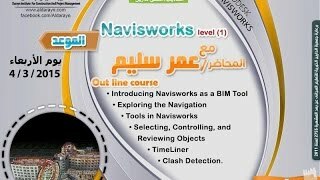 Navisworks (known for a while as JetStream) is a 3D design review package for Microsoft Windows. Used primarily in construction industries to complement 3D design packages (such as Autodesk Revit, AutoCAD, and MicroStation) Navisworks allows users to open and combine 3D models, navigate around them in real-time and review the model using a set of tools including comments, redlining, viewpoint, and measurements. A selection of plug-ins enhances the package adding interference detection, 4D time simulation, photorealistic rendering and PDF-like publishing.